On Monday, March 28, PBS KIDS will premiere the first PEG + CAT movie, “Peg and Cat Save the World.” The one-hour special will be followed by a week of new episodes of the Emmy© Award-winning series from The Fred Rogers Company, beginning Monday, April 4. In their all-new adventures, Peg, Cat and their friends will use problem-solving skills to overcome an array of challenges – from collecting 100 chickens running loose in the White House to working with friends around the globe to stop a planet-sized pig from destroying the Earth. 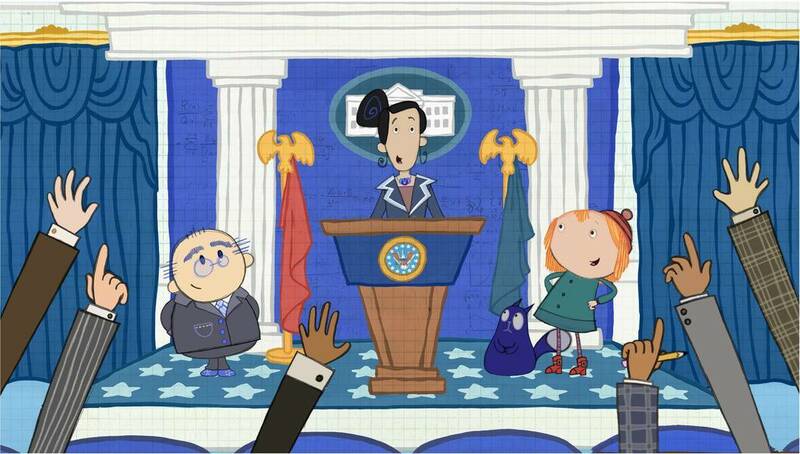 “Peg and Cat Save the World” follows the spirited friends to Washington, D.C., where they help the President of the United States, voiced by actor Sandra Oh, avert a crisis of national importance. The two-part movie highlights math and problem-solving skills, as Peg and Cat help save the Earth. “Peg and Cat Save the World” will air throughout the week of March 28 and will also be available for free on both pbskids.org and the PBS KIDS Video App, accessible by a variety of mobile devices and platforms such as Roku, Apple TV, Amazon Fire TV, Android TV, Xbox One and Chromecast. New episodes of PEG + CAT will air during the week of April 4th (check local listings). Press materials related to “Peg and Cat Save the World” are available on PBS PressRoom. PEG + CAT is co-created and executive produced by Jennifer Oxley (Little Bill, The Wonder Pets!) and Billy Aronson (Rent, Postcards from Buster), and produced by The Fred Rogers Company for PBS KIDS. Kevin Morrison of The Fred Rogers Company and Vince Commisso of production partner 9 Story Media Group also serve as executive producers. 9 Story, which distributes the popular series and manages licensing for the brand internationally, has secured distribution in more than 180 countries, providing even more opportunities for children around the world to tune in to the upbeat series. HiHat Media leads U.S. licensing initiatives for the brand. PEG + CAT is funded in part by the Corporation for Public Broadcasting (CPB), the National Science Foundation (NSF) Advancing Informal STEM Learning Program, and The Heinz Endowments. The President of the United States summons Peg and Cat to Washington, DC, to solve a problem of national importance. When strange signals are coming from space, Peg and Cat must use shapes to study patterns of the signals to save the Earth. After learning about a major problem in the nation’s capital, Peg and Cat call everyone they know to save the Earth from a planet-sized pig. “The Polka Dot Planet Problem” - When Peg’s spaceship breaks down, she needs the help of a new friend who communicates without speaking. “The Mardi Gras Problem” - To jam with Billie Holiday in the Mardi Gras parade, Peg and Cat must learn to use a diagram of notes – sheet music. “The Mermaid in the Mall Problem” - When a furniture store becomes a magical forest, Peg and Cat must become Knights of the Round Table – if only they can find a round table! “The Painting Problem” - To get purple paint for their masterpiece, famous painters Peg Casso and Vincent Van Goo (Cat) need a whole new kind of addition. “The Claymation Problem” - Temperamental director Richard finally finds performers he can totally control, shape and mold; they’re made of clay. “The Grumpy Judge Problem” - On the singing competition “Perfect Ten,” Peg and Cat must impress the toughest judge ever: the Grumpy Grouchy Bear. “The Imaginary Friend Problem” - Peg and the dinosaurs search the jungle for Cat and Minkus, his imaginary monkey. “The Promise Problem” - Nothing can keep Romeo and Juliet from meeting between their balconies – except maybe a dinosaur.